The Seahawk RB is a common name for a series of RB´s that have been designed and built by Mr Ove Dahlstedt and his team in Norrköping, Sweden since 1950 and on. Mr Dahlstedt is a legend in his time, he has been a professional diver since the 1950's but is now (almost) retired. 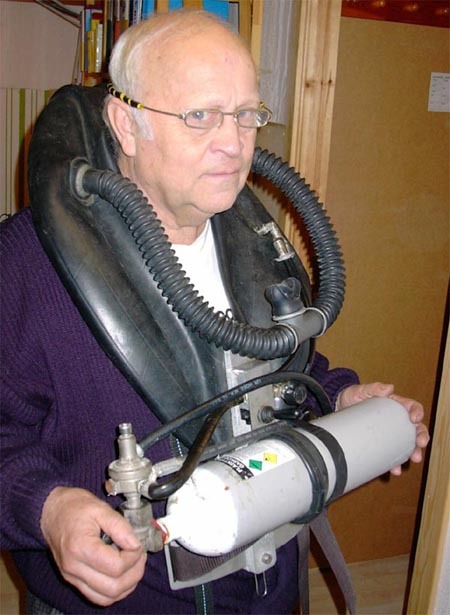 He built his first pendulum O2 CCR in the early 1950s and among other things he did professional dives down to 90m with trimix and homemade decompression tables in the 1970's! Mr Dahlstedt deserves a page dedicated to himself! The SeaHawk is used both as an O2 CCR and as a CMF SCR. 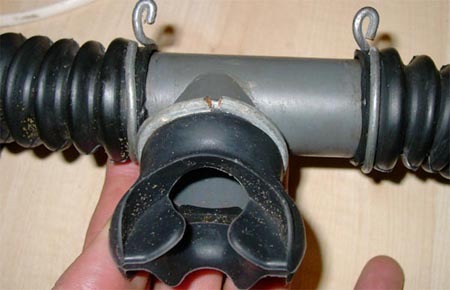 The basic design uses a car inner tube as the breathing bag and a tin can as absorbent canister. The Seahawk has a few unorthodox features that are depicted and described below. The unit in the pictures below belong to Mr Dahlstedt and the author hereby expresses his gratitude for the opportunity to photograph the unit. More than 15 units of a design similar to the one below has been built. The Seahawk is based on a car tyre inner tube. 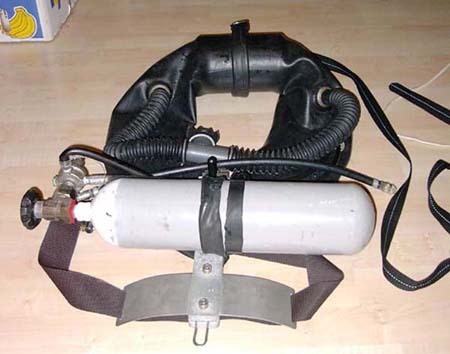 An axial scrubber is mounted behind the neck of the diver and the tube is sealed off behind the high pressure tank. Controls for flow and bypass are mounted centrally. The breathing characteristics of the Seahawk are excellent since the over the shoulder positioning of the breathing bags minimize the hydrostatic imbalance. The unit is very compact and nice to swim with. Mr Ove Dahlstedt himself wearing the Seahawk. 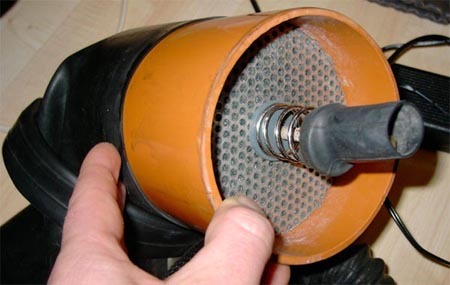 The scrubber canister is a axial flow design. 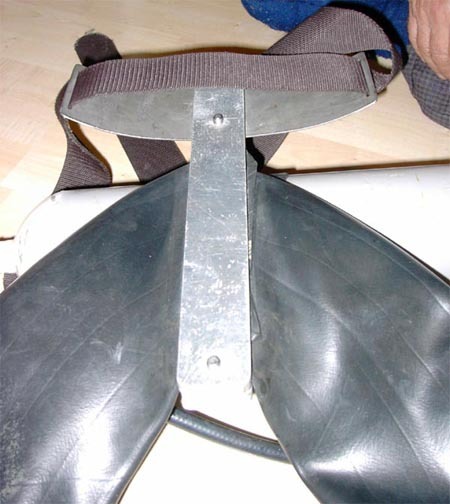 The outer diameter of the scrubber chosen so that the breathing bag fit snugly on its outside and it is secured by a clamp. To replace the soda lime one loosens the clamp and pulls the breathing bag away thus freeing the scrubber canister. 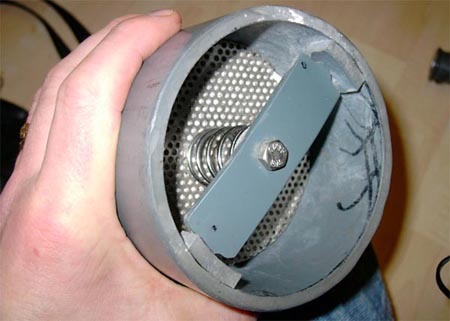 A nut / spring / stainless steel sieve combination is used to hold the sodalime in place. 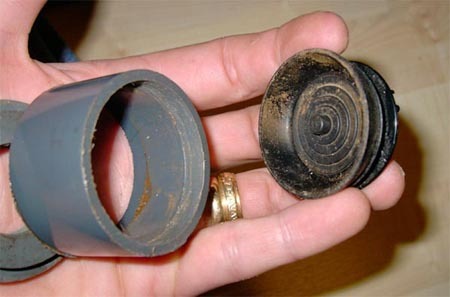 Another design of the canister with a bayonet fitting instead of the long screw in the design above. 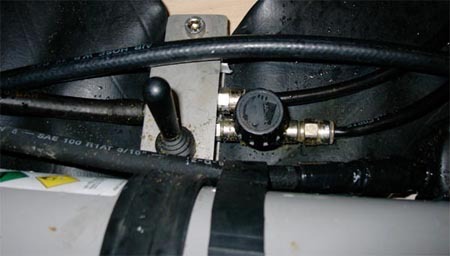 Close up of the bypass lever and a needle valve used for adjusting the oxygen or nitrox flow. The breathing tube connector and the breathing bag. 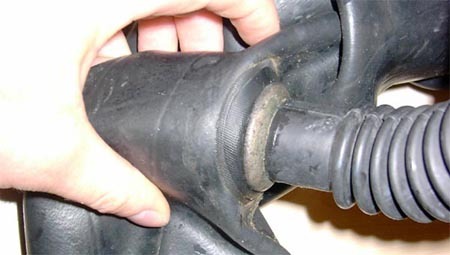 The inner tube is reinforced. The DSV, a unique design! 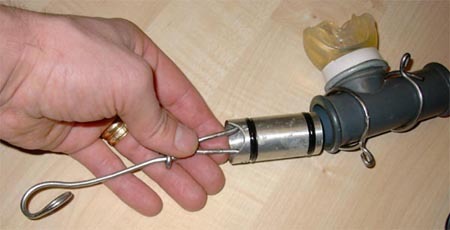 The DSV is opened and closed by pulling/pushing at a steel wire through the breathing tube. 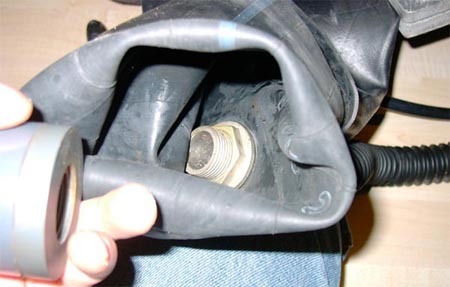 One grabs the steel loop seen to the right _THROUGH_ the corrugated breathing tube and pulls / pushs in order to open / close the valve. The opening of the DSV. The back / lower part of the breathing bag. A part of the tube has been cut away so the size of the breathing bags will fit nicely on the diver. The two openings are pressed together with the same aluminium blocks that holds the tank and gas flow controls. All material on this website is copyright 2002-2004 by Åke Larsson. All rights reserved.